I’m back in Vientiane in Laos for the first time since 1974, when I was here working on the very first edition of Southeast Asia on a Shoestring. 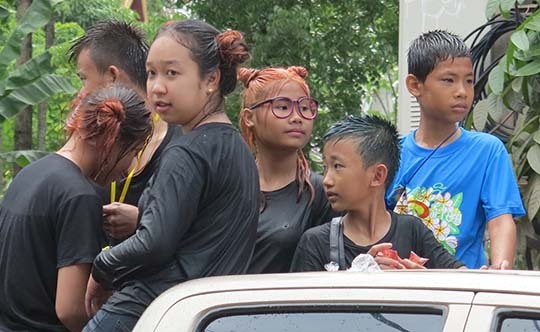 I’m sure it’s nothing like it was when I came through in 1974, I seem to remember at the time we were all trying to drink all the red wine in French restaurants before the Pathet Lao took over and poured it down the drains? I’ve been back to Laos a couple of times in recent years, but never back to the capital, Vientiane. 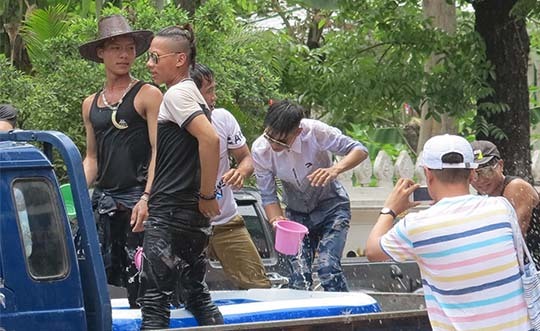 And what a day to be here, it’s the Laotian New Year and just like Songkran in Thailand it’s a celebration of water throwing and it reached a crescendo today. With my daughter Tashi and her boyfriend Richard I had a rather long lunch watching all the madness taking place right outside (we were just enough off the main street to avoid too much involvement ourselves). 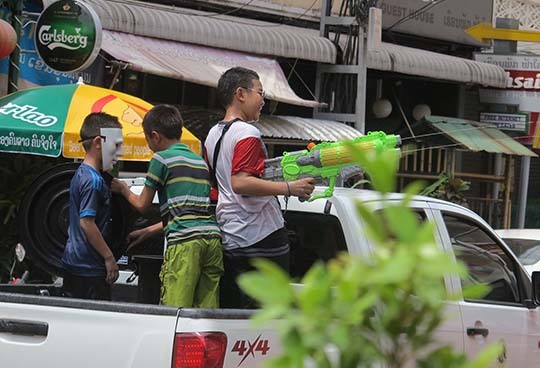 ▲ Half the (young) population is on the streetside, playing loud music, drinking BeerLao and throwing water at passing people, motorcycles and vehicles with water pistols (and water bazookas), jugs, cups, buckets, hoses, water balloons, whatever gets you wet. And we all have been wet. 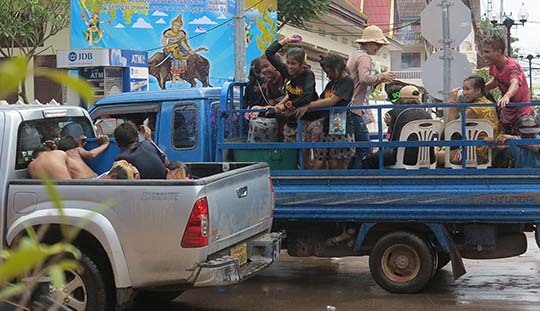 ▲ The other half of the (young) population is in the back of pickup trucks, tanked up with huge amounts of water which they are throwing at other (young) people in the back of other pickup trucks or at the streetside population busy throwing water back at them. ▲ Appropriate attire? Well anything you don’t mind getting soaked in, a lot of young women seem to consider it a wet T-shirt opportunity. 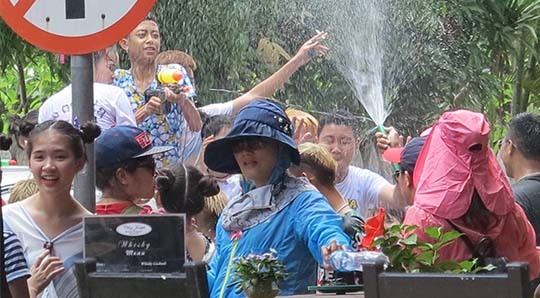 ◄ Some of them consider that high heels go well with water cannons.